One of Brazil's favorite pastimes is singing. Brazilians are fond of singing at barbecues, bus stops, parties and sporting events. It is common to see groups singing along to rhythms played with improvised instruments. 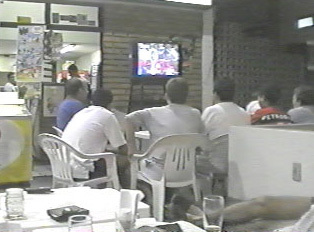 Soccer is the national sport, and Brazilians enjoy watching the games at bars, which in many cases have television sets only for this purpose. During the World Cup series, watching the games is a tradition even for those who do not usually follow soccer. As going to the movies is also a popular pastime, there are many movie theaters throughout the cities. In some areas, discounts of approximately 50% are offered to students with a student ID. In Brazil, the drinking age is twenty-one. The bars, which often open directly onto the street, are places for meeting friends and chatting over drinks and appetizers, as well as for watching sports. In the event of live music, a modest cover charge may be included in each person's bill. One goes to clubs for listening to music and dancing. Each club determines a minimum age, and requires a cover charge at the door. Bars and clubs generally close at sunrise although some stay open later. There are numerous parks in the cities, and on the coast, visitors find bars, restaurants, and structured activities related to the beaches. In summer, beach programs sponsor volleyball, aerobic classes, organized games, activities for children, and bingo for various age groups. At night there are often singers and other forms of live entertainment. "Group Singing at a Basketball Game"
"Singing at a ki Bar"
"Traditional Dance in the South of Brazil"
"Men and Women doing a Traditional Dance (South of Brazil)"
"Dance of Boleadeira in the Dark"